I have many interesting neighbors here in Kinshasa, but polygamous Ralph is the most flamboyant. I spy shamelessly. Ralph patrols in his full glory from a stepping stone. Actually Ralph has a few cousins with similar habits. One displays amidst the barbwire on the back wall and one suns himself on the roof of the neighbor’s shack, but Ralph has by far the best kingdom. He reigns from various positions on the avocado tree behind our house. Ralph watches over his harem with a few push-up displays to emphasize his dominion. The real wealth of Ralph’s kingdom however is on the ground in the avocado tree’s shade. This is where Georg, our dog, gets fed daily a heaping plate of rice and canned sardines. Often, as side dish, are tidbits of beef or goat meat from our table. What’s more, Georg is of a sharing nature, at least when he is inside lolling by the fan. Given this dependable wealth, Ralph has amassed a harem. We have counted at least the following: Rita, Rhona and Rhoda. There might be a Roxanne. Most of our stepping stones have little clutches of lizard eggs dug in beneath them. Rita, or Rhona, or maybe Roxanne? These lizardesses are unabashed coquettes. If Ralph comes anywhere close to one, she hunches her back seductively and lifts her tail high. The invitation could not be more explicit. Sometimes Ralph obliges. Sometimes, all too frequently it seems to me, he rebuffs the dutiful mate with no regard for her dignity. I suppose he might just be exhausted from their constant readiness. Besides he must preserve some energy for the threats from the outside. Despite the brush off, she’ll lift her tail and hunch her back just as seductively next time. 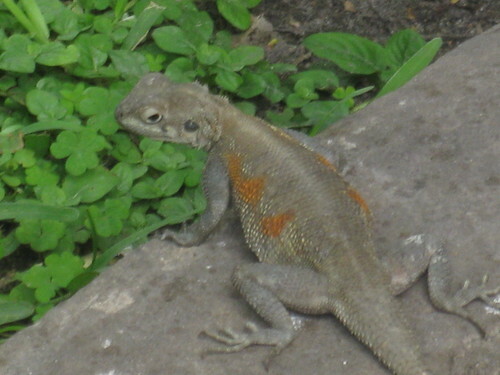 I’ve noticed an equally large lizard with the same commanding jowls but no bright orange and blue. My guess is that this will be Ralph2, biding his time. Perhaps he is already laying out a battle strategy. This must be a tempting kingdom indeed. Rita grabs a bite, but it is the bronze mannikins that get to finish it off. 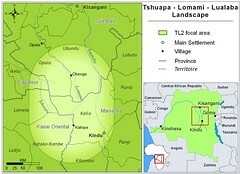 Next installment – Lizard Kingdoms up the Congo in Kisangani. I’ve noticed that Ralph’s more distant cousin, let’s call him Randolph, is less orange, more yellow. He lives on and around the mango tree at our Kisangani base. I have not yet had a chance to observe his behavior adequately. Then, there is no Kisangani equivalent to Georg with generous, somewhat lax “foreign aid” tendencies. Question: Can anyone identify this magnificent and very common lizard? I have no book here in Kinshasa that would help me. Common name? or scientific name? Answer: Thank you, John. This is Agama agama. The name is appropriate for someone who considers himself A++. There are 6 ‘A’s in 10 letters! This entry was written by Terese Hart, posted on 2009-11-07 at 4:56 pm, filed under Kinshasa. Bookmark the permalink. Follow any comments here with the RSS feed for this post. Post a comment or leave a trackback: Trackback URL. Great, John. The post has been updated ! Terese, this is a very fun post! I’m giggling out loud, late night in my office. Thanks for sharing. It balances out the two I showed my Human Evolution class Wed night on the bushmeat entries. Mama, I loved reading your post this Saturday morning with my over-sized mug of tea by my elbow. It had me laughing out-loud, and feeling quite homesick. Thanks for this lovely and informative blog post, Terese! 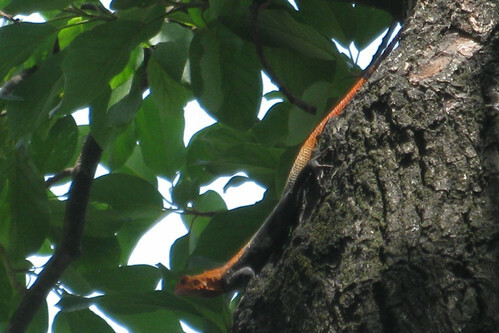 Since my arrival in Kinshasa last month, I have been seeing these bright, beautiful lizards everywhere, and I finally went online today to see if I could figure out what species they were. This proved to be not as difficult as I’d feared it might be, thanks to Wikipedia’s list, Reptiles of Africa. 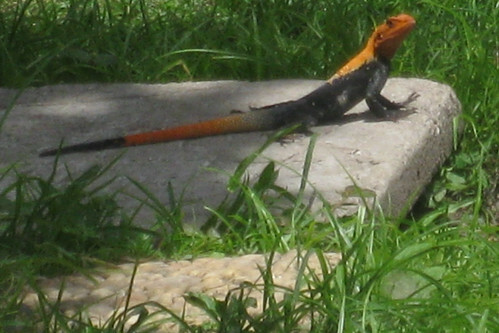 A subsequent google seach of Agama agama plus Kinshasa brought me to your blog, and the chance to learn a bit more about these rainbow-coloured (and, as it turns out, polygamous) neighbors of mine.